Because of its large battery, the Tesla Model S requires higher speed charging than other electric cars, and it turns out to have the most flexible charging interface of any electric car. Tesla Motors’ newest all electric car, the Tesla Model S, has a most interesting charging port that sets it apart from other electric cars. 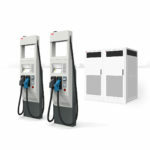 The proprietary design allows for 10 kilowatt, 20 kilowatt and even 90 kilowatt charge rates, through a slim and sleek charging connector, while most automakers struggle to support a 6.6 kilowatt charging rate. And then there’s last weeks story about the integration of solar panels with the 90 kilowatt Supercharger stations which Elon Musk hinted last week would demonstrate “sustainable power generation, and sustainable power consumption”. 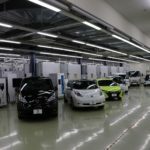 This week Tesla unveiled a new page on its web site demonstrating the various methods of charging the Model S.
The Tesla Model S, due to start delivery in about two weeks, with the Founder series cars delivered a couple weeks ago. It is an all electric car, designed from the ground up by Tesla Motors engineers. It supports a driving range of up to 300 miles (or more depending on driving habits), top speed well over 100 miles per hour, and 0-60 times of 5.6 seconds (or 4.4 seconds on the Performance model). The level of performance and revolutionary technology in the Model S comes largely because of the large, 85 kilowatt-hour, battery pack on-board the top end models. Such a large battery pack requires a high power charging system to have a reasonably fast recharge time. Because of that Tesla’s engineers felt it necessary to go with a proprietary charging port, rather than to adopt the standard (J1772) charging technology. What the company did, however, was to design the most flexible charging system imaginable, supporting adapters to the standard charging technology, as well as any power outlet you may find, and while supporting high charge rates through Tesla’s proprietary charging stations. By default the Model S comes with a single 10 kilowatt on-board charger. As an option the Model S can be equipped with two chargers for a 20 kilowatt charging rate. Before delivery Tesla recommends you either install the “High Power Wall Connector” charging station, or install a high power 240 volt outlet (pictured is a NEMA 14-50 socket, good for 240 volts at 50 amps). The company has an arrangement with Solar City to assist with setting up the charging station or power outlet. There are two charging station options for the Model S owner, the “Mobile Connector” and the “High Power Wall Connector”. 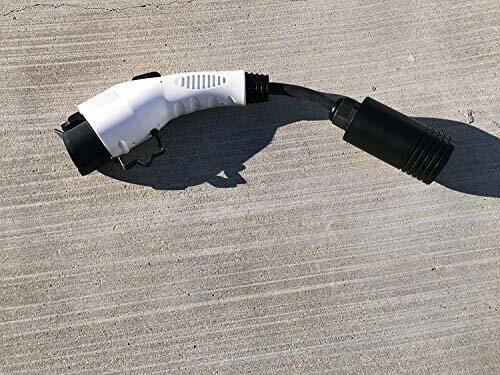 The “Mobile Connector” is a charging cord similar to the 120 volt charging cord delivered with the Nissan Leaf, Chevy Volt, etc. It’s also similar to the power bricks used with many electronics gadgets. One end of the mobile connector plugs into the Model S charging port, the other end plugs into a power outlet. It has adapters to plug into either 120 volt or 240 volt outlets (again, the NEMA 14-50 is pictured). A range of adapters is available for various styles of outlets. Unlike the charging cords delivered with other electric cars which are meant for emergency charging in case you cannot find a real charging station, it appears Tesla expects the mobile connector will, for some Model S owners, be used for routine every day charging. 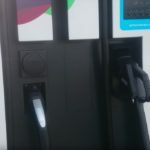 Where other company’s 120 volt charging cords only support a 1.5 kilowatt charging rate, the Tesla mobile connector supports up to a 10 kilowatt charging rate. What’s the advantage to a higher charging rate? At 10 kilowatts a Model S will gain 31 miles of driving range per hour of charging, while at the 1.5 kilowatt charging rate it gains only 5 miles per hour of charging. 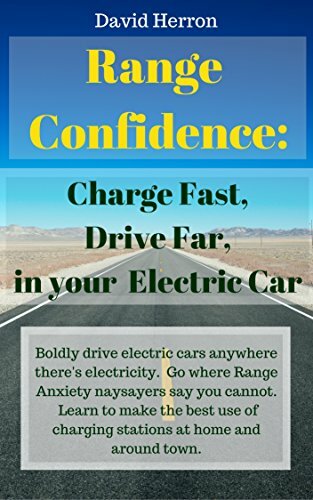 If you’re stuck somewhere and can only find a 120 volt outlet, that five miles of driving range can be extremely helpful, but if you can find a higher power outlet the 31 miles of range is even more useful. Earlier we said the Model S can support either a 10 kilowatt or 20 kilowatt charging rate. The “High Power Wall Connector” is Tesla’s version of the fixed installation charging station concept. It’s a device that will be sold to Model S owners, and is meant to be installed at home. It supports the the 10 kilowatt or 20 kilowatt charging rate (twin on-board chargers). 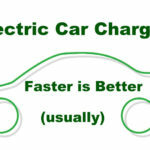 With “twin chargers,” the 20 kilowatt charging rate gives 62 miles per hour of charging. 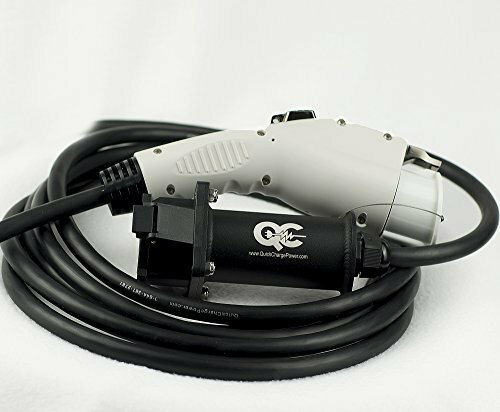 The High Power Wall Connector must be plugged into a 240 volt outlet, and to use it on a Model S equipped with twin chargers requires a 100 amp circuit, while a single charger Model S can get by with a 50 amp 240 volt circuit. The Supercharger is Tesla’s proprietary answer to the CHADEMO versus SAE Combo battle. It is supported on the Model S’s with 85 kilowatt-hour battery packs, and on specially equipped 60 kilowatt-hour models. 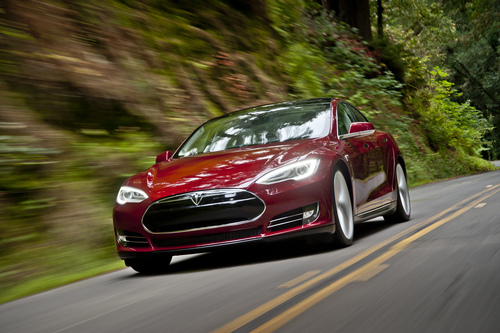 When plugged into a Supercharger the Model S gains over 300 miles of driving range per hour of charging. Reading between the lines, as well as cribbing some notes from teslaownersclub.com, we note that with a 300 mile driving range a Model S can easily travel around any metropolitan area without needing to use the public charging infrastructure. A Model S owner could depend on their home charging station for most of their charging needs, except for long distance trips. Being able to drive 300 miles at a stretch, then gain 300 miles of range in an hour of charging, is extremely compatible with that American past-time, the road trip. The most useful place for Supercharger installation would be along major interstate highways between major metropolitan areas, or exactly what Tesla’s website says. In fact, Tesla already has experience with this, in the form of a partnership between Tesla, Solar City and Radobank to install charging stations along the San Francisco to Los Angeles corridor. This has allowed Tesla Roadster owners to make SF-LA trips by electric car, a feat that would be impossible under the electric car stereotypes. 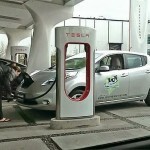 If a Model S owner does want to use a J1772 charging station, an appropriate adapter is provided as standard equipment. Some of the J1772 charging stations even support a high charging rate. A Model S owner can use the Model S smart phone application to track the charge state, or start the air conditioning or heating systems. In short, the Tesla Model S has a charging system with capabilities well beyond those on other electric cars. With the ability to gain 300 miles of driving range in an hour of charging, it is the first all electric car which could deliver on that American past-time, the road trip.